You know what yôkai are, right? 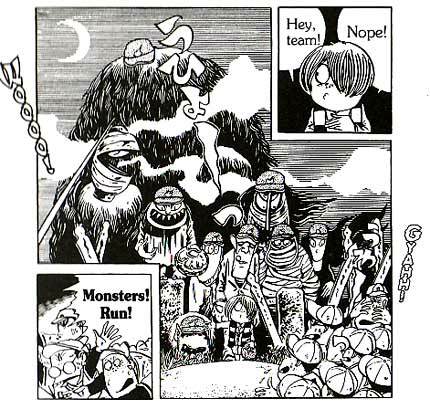 Mysterious, morally ambiguous sort-of-demons that crop up all over Japanese folklore? Chances are you do, even if you don’t automatically identify them by that term, because they’re all over manga. One of the reasons for that ubiquity is the subject of today’s license request, suggested by Kate Dacey. 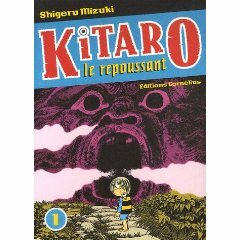 According to Wikipedia, Shigeru Mizuki’s GeGeGe no Kitaro gets the credit for pushing yôkai into the pop-culture spotlight, at least in terms of manga. It was originally created for the manga rental market in 1959, then serialized in the late 1960s in some of Kodansha’s shônen magazines. 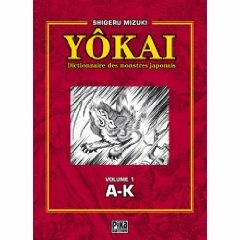 It ended up being nine volumes long, and it’s been republished in other formats, as will happen with really popular series. 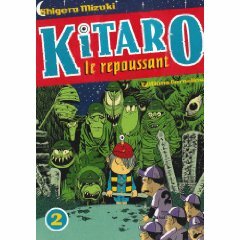 Our hero, Kitaro, is one of those supernatural types that just want everyone to be friends, Casper the friendly yôkai, if you will. He uses a wild arsenal of weapons and body parts to protect humans from the schemes of his kinfolk, aided by his father, a disembodied eyeball. There’s also his rat-like companion who hasn’t bathed in over 300 years and, for balance, a cat girl, plus lots of other yôkai, including an elderly landlady type. Among the things that almost always make comics better are elderly landlady types. You are currently browsing the The Manga Curmudgeon blog archives for the day Friday, November 20th, 2009.